The NBA playoffs will start this weekend with a match up that the Raptors and true fans didn’t want to see happen will. On the last day of the season the New Jersey Nets destroyed the Chicago Bulls to clinch the sixth place seed in the Easter Conference playoffs. Instead of the Raptors having to face a lowly Washington Wizards team without Gilbert Arenas, they will have to face a team that has Jason Kidd, Vince Carter, and Reggie Jefferson. Vince and the Nets have been on fire lately and are peaking at just the right time. The first game will be Saturday at 12:30pm in Toronto at the Air Canada Center. 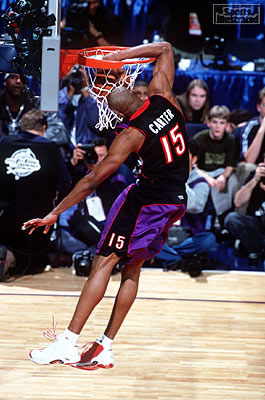 The media circus will be immense and once the game starts the booing of Vince Carter will be deafening. The impact that Carter has had on this organization cannot be understated. From the highs of 2 playoff runs and the publicity of the Slam Dunk contest to the lows of management interference and mailing it in so that he would be traded. The only player left from that trade is Joey Graham, who will be coming off the bench to guard Carter. The curse of Vinsanity looms in every hallway, gate and seat of the ACC. Fans with number 15 on the back of their jerseys remind everyone about how much they looked up to the budding super star and how disappointed they are that the star fell so low. The only way to get rid of those bad memories and vanquish the VC demons is for the Raptors to beat the Nets in the first round and grab hold of Toronto’s new rising star Chris Bosh.